The current World Player of the Year kicked five from five as the French league leaders tightened their grip on Pool 3 with a bonus-point win. 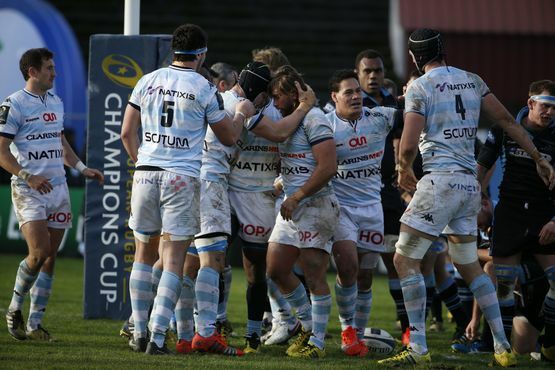 But defeat at Stade Yves-du-Manoir put a serious dent in Glasgow’s hopes of progressing the quarter-finals. Leone Nakarawa’s second-half try briefly offered a glimmer of hope. But the power of the Racing pack proved too much as front-row trio Ben Tameifuna, Dimitri Szarzewski and Eddy Ben Arous all crossed before Manuel Carizza injury-time effort clinched the bonus. That saw Racing take a seven-point lead over Northampton Saints while third-placed Glasgow must now win both of their remaining ties to be in with a chance of progressing as one of three best runners-up. This tie was originally due to be played in November but was postponed following the terrorist attacks in Paris. Glasgow led on 15 minutes through the boot of Finn Russell, back in the team for the injured Peter Horne. However the Warriors were made to pay for Russell and Stuart Hogg both narrowly missing further efforts before their hosts had registered a point. A turnover by Chris Fusaro led to the first chance that Russell pushed wide but a break from lock Leone Nakarawa handed him a second chance soon after that the centre converted. Hogg then narrowly missed from distance before Carter opened his account with a penalty that levelled the scores on 25 minutes. And the current World Player of the Year was involved twice in the move that led to the game’s opening try. Full-back Johannes Goosen led the Racing counter-attack from Hogg’s lengthy kick. Carter combined first with Wenceslas Lauret and then Alexandre Dumoulin before sending giant prop Tameifuna crashing over from close range. Carter converted and added a penalty for a 13-3 lead at half-time. And Racing wasted little of the second half to quickly extend that lead with two quick-fire tries in the space of six minutes. Both were from the same position with a Racing lineout some five metres out from the Glasgow line and both had similar outcomes as captain Szarzewski and then prop Ben Arous applied the finish to impressive collective drives from the French pack. Despite trailing 27-3, Glasgow showed enough conviction to hit back and an opportunist try from Nakarawa offered a glimmer of hope. In a well-worked move, Nakarawa caught Racing off-guard by taking Fraser Brown’s throw at the front of a lineout before stretching out to score one-handed with 21 minutes remaining. But with 80 minutes up on the clock, the French pack again combined, this time for lock Carizza to touch down to clinch maximum points.